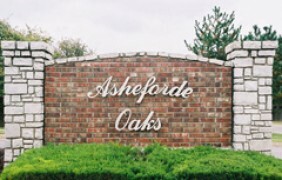 The Asheforde Oaks Addition is located on the Northeast side of Edmond, OK, between Bryant and Coltrane on the North side of Covell Road. Many amenities are enjoyed by the owners such as: walking trails, community swimming pool, treed lots, landscaped entrance ways, active mandatory HOA, and community activities. There are approximately 220 homes in the addition. Sign Up Now for AOHA E-News! This will allow us to alert everyone quickly with information pertaining to our neighborhood. We will also be utilizing the website in place of our newsletter, and will be emailing everyone when new information is added. We hope that this system will be an effective alternative to the costly and time consuming job of publishing a newsletter. Thank you for your cooperation during this transition.